Over the years, The Smith Opera House has hosted a panoply of events, many of which have little to do with performing arts. In recent years, The Smith has served as a gathering place for some of the larger races in town. Athletes participating in the Musselman triathlon or the Seneca 7 relay often began their journeys with packet pick-ups or pre-race briefings inside the opera house. But The Smith’s connection to sporting events began much earlier. A number of athletes threw their hats into the ring—the boxing ring, that is, in the early twentieth century. Dan Deegan returns Boxing to The Smith. ‘Democrat and Chronicle,’ 7 October 1929, p. 202. One of the earliest mentions of boxing at The Smith was in February 1905. The local Eagles club had organized a vaudeville and athletic fundraiser to add to the coffers of their “sick and benefit fund.” According to the ‘Buffalo Enquirer,’ “a number of well-known Buffalo, New York and Canadian athletes had been engaged and tickets were readily sold at from $1 in the gallery to $2 in the boxes” (which would have been the equivalent of roughly $28 and $56 today) (“Anvil Chorus” 8). No punches were actually thrown inside The Smith, however, as “the committee was informed that the Chief of Police would not allow any boxing on the program as it was against the law” (“Anvil Chorus” 8). The ‘Democrat and Chronicle’ reported that the Police Chief was also joined by the local Sherriff in this ban (“Geneva Eagles” 15). The Eagles rearranged their program, adding additional vaudeville performances. The boxing went on, however, at a “stag entertainment” at the Eagles Hall after the performances at The Smith. Close to a thousand people witnessed a “fast, six-round exhibition of boxing” in which “the gloves weighed eight ounces and there was no ring or canvas on the floor but the boys nevertheless, sadly handicapped, put up an excellent contest” (“Anvil Chorus” 8). The next mention of boxing and The Smith appears to be in August 1919. A local promoter by the name of Dan Deegan created an organization known as the Geneva Amusement Club, Inc. On August 13,1919, the organization produced “six snappy bouts” in front of “a capacity crowd, including many women” (“Rochester Battler” 23). Dan Deegan produced an array of sporting events over the years in Geneva but boxing seems to have been his forte. 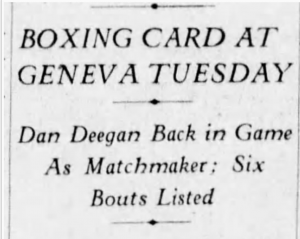 The Geneva Historical Society has written a great deal about Dan Deegan’s pursuit of boxing—in spite of bans outlawing it in New York State (Askins, https://genevahistoricalsociety.com/people/dan-deegan-boxing/). As the Historical Society and the ‘Democrat and Chronicle’ note, Deegan appears to have taken a break from promoting boxing but returned boxing to The Smith in 1927. “Dan Deegan is back in the game,” hailed the ‘D & C’ (“Boxing Card” 17). 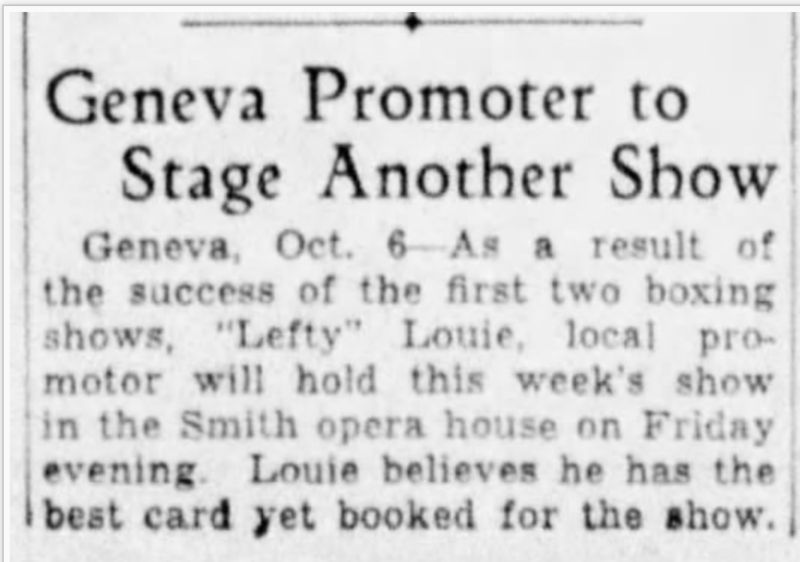 By 1929 the torch appears to have been passed to another local promoter, “Lefty” Louie, who produced Friday night fights in the Opera House (“Geneva Promoter” 20). These boxing matches would have been among some of the final performances in The Smith before it was closed for massive renovations, following its purchase by Schine Enterprises. 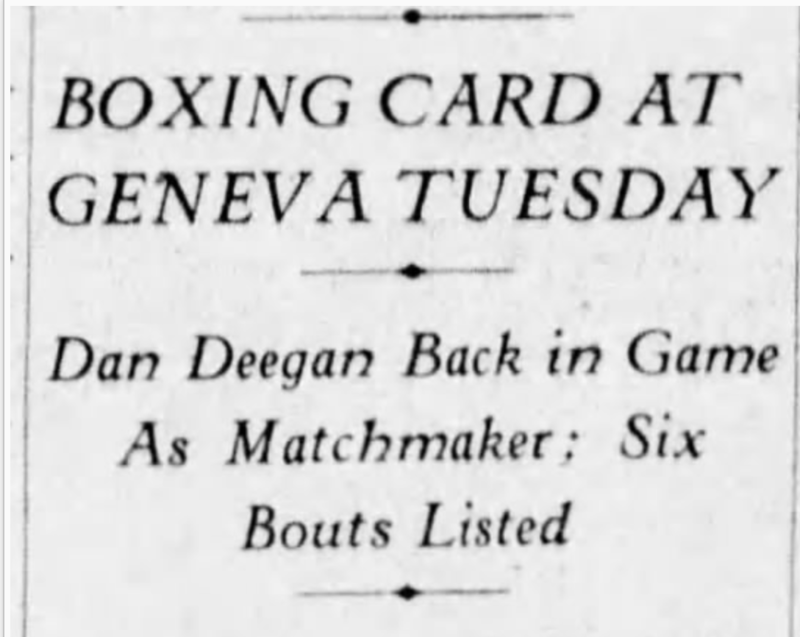 “Boxing Card at Geneva Tuesday.’ Democrat and Chronicle, 30 October 1927, p. 17. “Geneva Eagles Had Their Wings Out.” Democrat and Chronicle , 8 February 1905, p. 15. 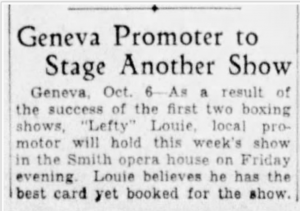 “Geneva Promoter to Stage Another Show.” Democrat and Chronicle, 7 October 1929, p. 20.